Our annual Healing Art Box campaign provides the gift of art to 1,200 underprivileged children suffering from illness grief or stress. The 2019 campaign is underway and we need you! Help us deliver bags and boxes with brand new art supplies! It’s quick to sign up. You’ll have a custom link to share with your friends. Set your funding goals, reach out to friends, fundraise together, and monitor your progress! 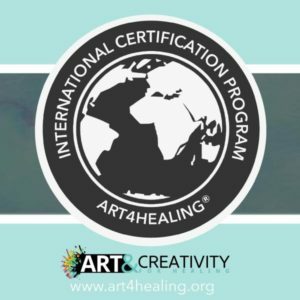 What is a healing art box? For only $20 per box, we put together a shoe box filled with 10 different brand new art supplies. We also include a series of exercises to stimulate and entertain children experiencing hardship. Who receives these art boxes? Children whose families are experiencing financial hardship or homelessness. Provide a cash donation. 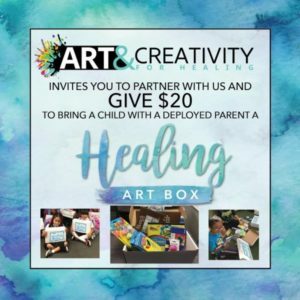 It’s only $20 to provide a Healing Art Box to a child in need. If you’re feeling extra generous and know someone to fund the program, $20,000 buys all the boxes! Smiles start at $20 with the donation of one Healing Art Box! Become a Healing Art Box Fundraising Team Leader! Fundraising Team Leaders are an essential part of our annual Healing Art Box campaign. Share on social media – Facebook, Twitter, Snapchat, anywhere! Invite your friends and family to join your team and donate. Have Fun! – Watch your progress as your friends and family join and your thermometer climbs towards the goal! As a Fundraising Team Leader, you’ll help bring smiles and art to underprivileged children in our community! Check out the video from a previous holiday giveaway!